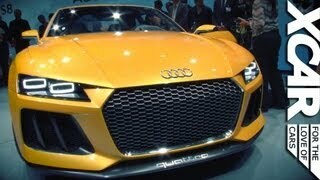 Audi has unveiled the 2013 Audi Sport quattro concept, the musclebound short-wheelbase coupe, at the 2013 Frankfurt Motor Show in Germany. Audi is projecting into the future with the help of ideas that were first seen in the Audi quattro concept study unveiled at the 2010 Paris Motor Show. On the exterior the car is characterized by the hexagonal single-frame grille, Audi Matrix LED headlights, the “blisters” above the fenders, the CFRP diffuser on the rear, rectangular tail lights, a rear spoiler and 21-inch wheels. 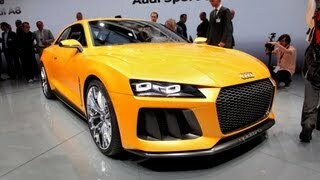 The concept of elegant sportiness carries over to the interior of the Audi Sport quattro concept. The spacious cabin is awash in dark gray tones and precise lines. The lightweight construction typical for Audi is reflected both in the design and in the choice of materials. The support structure of the interior is a carbon shell that also serves as a storage compartment in the side doors. The 2013 Sport Quattro Concept is powered by a 4-litre twin-turbocharged TFSI V8 engine producing 412 kW (560 hp) and 700 Nm (516.29 lb-ft) of torque. It draws its traction energy from a liquid-cooled lithium-ion battery in the rear with a capacity of 14.1 kWh, adding another 150 hp and 400 Nm of torque. 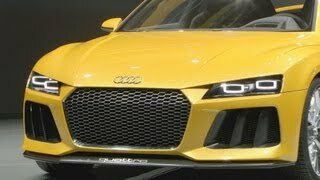 When the V8 and the electric motor work together, the Audi Sport quattro concept accelerates from 0 to 100 km/h (62.14 mph) in 3.7 seconds with a top speed of 305 km/h (189.52 mph).